It adds an additional RS-232, RS-422, or RS-485 (half- or full-duplex) serial port to an SDM-capable datalogger for interfacing with serial sensors or other devices. The SDM-SIO1A connects to a remote serial device using industry-standard hardware that can be set to true RS-232, RS-485, or RS-422 signal levels. When operating in RS-232 mode, the module also supports hardware handshaking. RS-422 mode is functionally the same as RS-485 mode, except the connection is limited to a point-to-point system. Connections and programming for RS-422 are otherwise identical to RS-485. The SDM-SIO1A will accept serial data up to 6143 bytes and store it in its buffer. This allows remote equipment to transmit large amounts of data without needing to stop other processes in the datalogger. 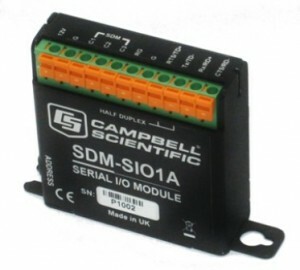 Up to 15 SDM-SIO1A modules can be connected to a single datalogger using the SDM port, allowing a user to connect 15 different serial devices to a datalogger with ease. This is in addition to any connections made to the dataloggers via other serial ports.